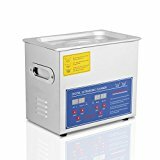 More and more professional and commercial industries now prefer ultrasonic cleaners instead of washing machines and manual hand-washing. This is because the ultrasonic cleaning technology proves to be beneficial in many ways such as work safety, efficient cleaning, and time-saving. 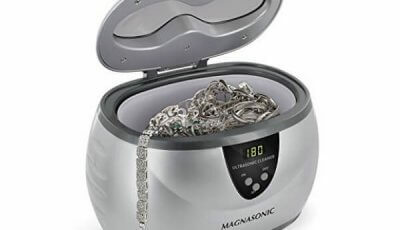 This guide will explain what an ultrasonic cleaner is, how it works, and what to look for when buying one. 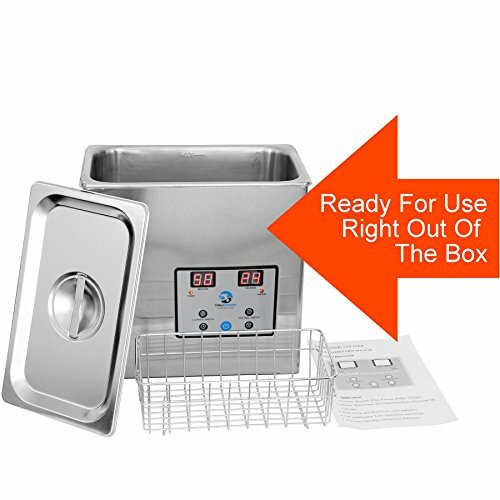 Also, reviews of some of the best ultrasonic cleaners are provided to help you decide which product will suit your cleaning needs and budget. 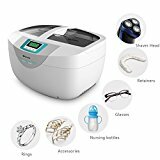 An ultrasonic cleaner is a multi-purpose cleaning machine that uses ultrasound technology to clean and sanitize items such as jewelry, medical and dental instruments, gun parts, tools, carburetors, and so much more. 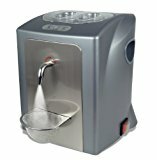 Ultrasonic cleaners can be used for both personal and commercial cleaning purposes. The process uses appropriate cleaning solvents or agents to remove dirt, stain, and/or grime from the items placed in the tank basket. It also cleans fast (normal cleaning is usually less than 10 minutes), so you save more time compared to hand-washing and machine washing. 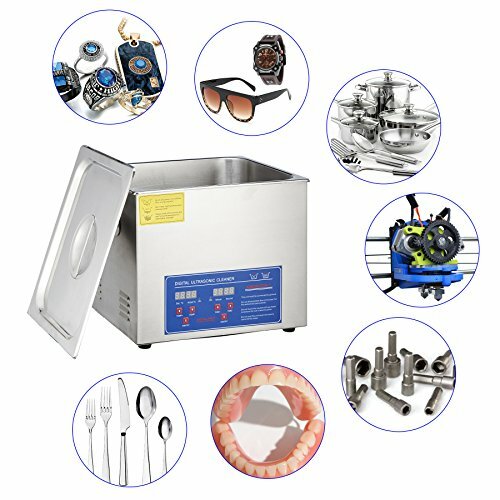 And because they prove to be adequately efficient for commercial use, ultrasonic cleaners are widely used in dental clinics, surgical units, jewelry stores and workshops, electronic workshops, law enforcement agencies, and optical supplies, e.g contact lens, eyeglasses, among others. 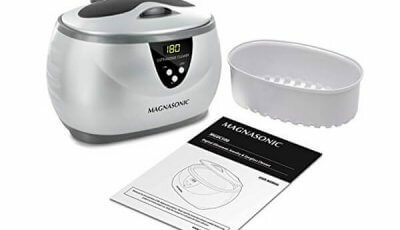 The Magnasonic comes in two sizes and frequency modes — heavy-duty 600ml and dual-wave heavy-duty 850ml. 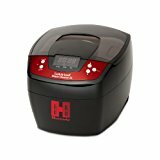 It is easy to use and has a digital display with preset cleaning cycles. 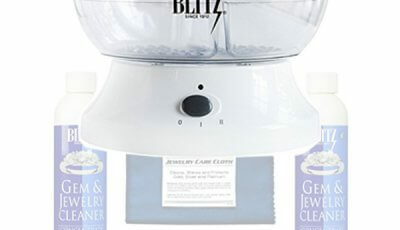 The great thing about this jewelry cleaner is that it can deliver high-quality cleaning using just plain water. It can effectively remove dirt and spots without the aid of harsh solvents that can actually damage the surface delicate items. The Angel POS is an extremely heavy-duty cleaner that can hold up to 10L in its tank. It delivers highly efficient metal cleaning for carburetors and can be used with different cleaning agents. Metal cleaning using different solutions is made easier by using its heater temperature control. Applying the right heat temperature to the right cleaning solution is important to deliver high quality cleaning results. The TruSonik is equipped with a Frequency Sweep, a built-in frequency micro-adjustment feature that automatically adjusts the cleaner’s frequency to match the cleaning solution used in a cycle. This is an excellent and helpful feature because matching the cycle frequency with the cleaning solution’s chemistry maximizes the cleaner’s optimum cleaning potential. The parts are disassembled to allow for better, more effective cleaning coverage and crevice penetration of guns and gun parts. The great thing about this cleaner is that the Frequency Sweep actually works with different solutions, so you can clean your gun parts without worrying about possible explosions, which can happen if too much heat is applied to solutions with combustible chemicals. 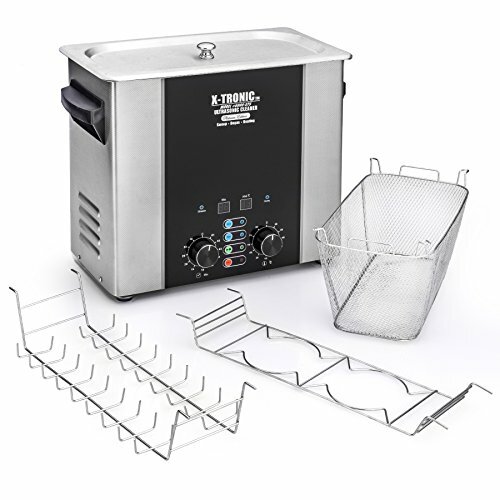 The X-Tronic platinum edition comes in 2, 3, and 6 liters commercial ultrasonic cleaners. It features a digital LED display for the cycle timer and heater control. It also has the Frequency Sweep to maximize cleaning results for different solutions, and a degassing function to stabilize your cleaning solution before running a cycle. The catchy feature of this cleaner is that every set comes with three different baskets that you can use for different items. This is particularly cost-efficient for commercial cleaning purposes. The fine mesh basket, wire rack holder, and wire beaker holder are all made of stainless steel. 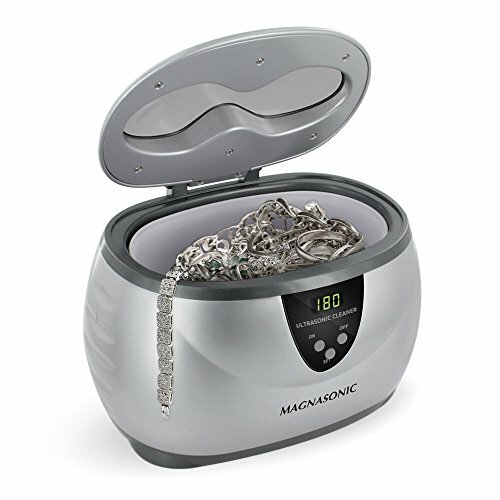 An ultrasonic cleaner uses a transducer that generates around 20 to 400 kHz of ultrasound to produce cavitation bubbles. These "bubbles" are microscopic and agitate the liquid where the high-frequency pressure waves are applied. This process of agitation is what forces residues and contaminants to dislodge and peel off from the surfaces and crevices of items being cleaned. The items to be cleaned are placed in a basket or tray, which is then placed inside the cleaner tank filled with water or solution containing a cleaning solvent. 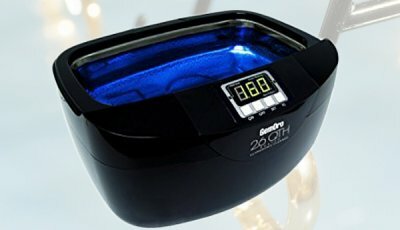 The ultrasonic cleaner can be used for items made of metal, glass, plastic, rubber, and ceramic materials. Appropriate solvents help in the cleaning process by chemically altering and loosening the residual substances and contaminants so that the cavitation bubbles can easily scrub and dispel them away from the items. The solvents used depend on the type of cleaning the items require. Aqueous solvents are usually used for removing grease and oil because they contain surfactants that dissolve the dense compounds. Organic solvents are also available for use on delicate or food-grade items. Even plain water can be used for items that need an extra gentle cleaning. 1. Types of items to be cleaned – This is important. If you intend to use the cleaner only for dental instruments, then stick to choosing a cleaner with the suitable tank size and power frequency that are adequate for those items. If you buy a cleaner that is too small, you will end up cleaning your items in small numerous batches that will take up more time to finish and spend more power to operate. On the other hand, if you buy a cleaner that is too big, you will end up using more cleaning solution and spend more power than necessary. 2. Types of solvents used – Different types of solvents are used for different types of items. What you need to do is to make sure that the manufacturer of the cleaner you get also provides or manufactures the type of solvent appropriate for your items and the cleaner itself. If the cleaner you’re interested in only uses proprietary solvents that are not compatible with your items, it’s better to just cross it off your list and find a better one. Or, just choose the cleaner that can be used with any kind of solvent available from different manufacturers or brands. 3. Tank and basket size – This is perhaps the very first thing you should consider in choosing a cleaner. Make sure that the dimensions of the tank and basket of the cleaner are appropriate for the size of your items. Don’t choose or settle for anything that is smaller than the size and number of your items. For example, if you intend to clean only small jewelry items, a 750ml tank will do great for you. But if you need to clean heavier items like guns and gun parts, then it’s best to choose a cleaner tank with a capacity of 2 liters or more. 4. Working frequency – The cleaner’s working frequency is very important because the cleaning power and efficiency depend on it. For items that need full surface scrubbing or removal of highly dense compounds, low-frequency cleaners (20 to 40 kHz) are more efficient for the job. 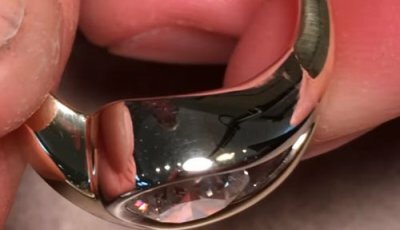 This is because lower frequencies create larger cavitation bubbles that are more effective in removing thick grime and residues. Higher frequencies, on the other hand, create smaller bubbles that are more efficient in delicate and detailed cleaning. So for jewelry, optical parts, dental and surgical instruments, you should choose high-frequency cleaners (45 to 130 kHz). However, if you need to clean items that require different frequency levels, you can choose dual-frequency models that you can set in low or high frequencies whenever you need to. 5. 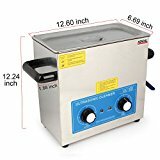 Budget – If you are only looking to buy an ultrasonic cleaner for personal use, you don't need to force yourself to buy a more expensive industrial or commercial grade cleaner. 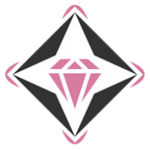 If you are buying for your business, consider getting the best cleaner you can afford because high quality cleaners prove to be more cost-efficient in the long run. 6. Service and warranty - Make sure that the manufacturer of the cleaner provides reasonable warranty coverage and accessible warranty and repair services. Whatever type and brand of ultrasonic cleaner you choose to buy, make sure that it meets most (if not all) of your cleaning requirements. Settling for something less than what you require can lead to problems in efficiency, repair and replacement costs, and product lifespan.